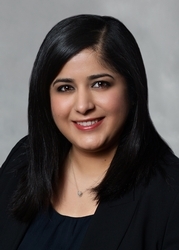 Hill Wallack is pleased to congratulate family law attorney, Megha R. Thakkar, on being selected as one of New Jersey Law Journal’s New Leaders of the Bar. In selecting its New Leaders of the Bar, the New Jersey Law Journal recognizes attorneys yet to reach the age of 40 for their notable achievements and outstanding potential. Megha will receive her award at the Professional Excellence Awards Dinner on June 12, 2019, at the Brooklake Country Club in Florham Park. Megha is Counsel in the Princeton, New Jersey office of Hill Wallack LLP, where she is a member of the firm’s Family Law practice group. She represents clients in all aspects of divorce and family law, including litigation, mediation, and arbitration, custody matters, alimony and child support disputes, post-judgment applications, prenuptial agreements, and domestic violence litigation. She is also a qualified mediator in family law matters and volunteers as a Matrimonial Early Settlement Panelist in Middlesex and Somerset Counties. Megha is active in the Middlesex County Bar Association and presently serves as Secretary on its Board of Trustees.